With the World Cup in South Africa upon us, everybody's getting caught up in the fever. Hooray for soccer! But newbies, take note: This competition existed well before every game was broadcast in HD and the U.S. had a decent team. Eighteen times, in fact—eighteen glorious tournaments full of moments to remember, from the magic (Pele) to the tragic (Andres Escobar) to the Maradona-ic...yeah, 'nuff said. So, to prep you for the month of madness, we sought the help of noted footy author (and real-life Englishman!) 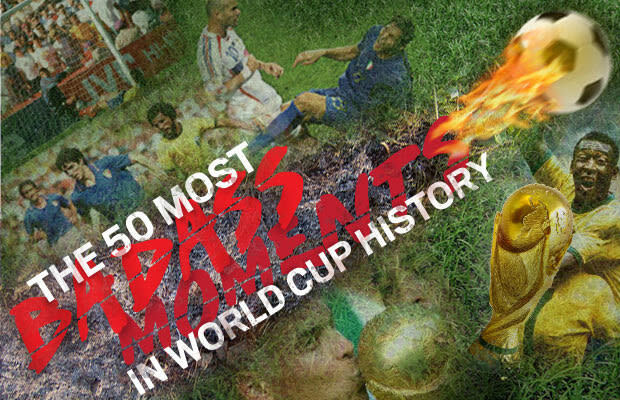 Tim Webber to compile this comprehensive list of the greatest World Cup moments of all time. Oh, whoops, did we say "greatest"? What we meant was: badass! RELATED: Sneaker Report - How Much Will the 2014 World Cup Winner Receive?